When I first met my wife she warned me that she had dogs. No problem, I like animals. ..but I may have been too distracted to focus on the operative word, 'warn'. Then I was introduced to Tasha and Nakita. My experience with pets up to this point had been a revolving door of disposable hamsters and a couple of chubby cats, and now I'm facing down two very big, very scary Huskies who are staring me down while trying to figure out exactly why this skinny little white boy was in their home. I had to learn fast how to handle big dogs and made some very notable mistakes along the way, but I quickly came to love the both of them. Soon I wrestling them into snowbanks and had persuaded them, for the most part, not to feast upon my pale, soft flesh. Nakita was even the first dog to ever smile at me, which is a hard thing to describe unless you've seen it. Tasha died a month before my doctor noticed a problem on the x-ray and scheduled a biopsy. She was sixteen and it was simply her time. A fighter until the end it took four people and three muzzles to keep her from taking a chunk out of vet, all while under heavy sedation. Also, my wife wrecked the car that month. Suddenly our lives had become a country song. By this time, Natika was pushing fourteen. A little grayer around the nose and definitely slowing down, but still going strong. The hardest time of the whole cancer ordeal was those first few months. The first biopsy took place at the beginning of December, but came back inconclusive so they scheduled another one. It being the Holiday Season, that didn't happen until just after New Years. Then during the second procedure some idiot radiologist assistant offhandedly tells me, 'its probably lymphoma'. We were left with that dangling over our heads for a month until the beginning of February when I finally got to see an oncologist. I started chemotherapy the very next day. Needless to say, January was pretty bleak, but I do have one good memory We live at the end of a cul-du-sac and beyond us is a sliver of woods that spreads out, leading down to a network of creeks. Those all eventually spill into a two small lakes, the closest of which with the imaginative name of, 'Second Lake'. Now in a straight line, Second Lake is maybe only a couple of miles from the house, but if you go down into the woods and follow the creeks it can take hours. 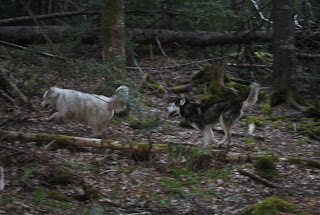 There are lots of different trails, thickets for the dogs to crawl around in, even train tracks and a horse farm if you know where to look. Over the years, we spent hundreds of hours exploring down there. It gave the dogs a chance to be let off their leads to roam and run around. They got to chase squirrels, rabbits and deer, but the only animal they ever seemed to catch were porcupines. The one thing we could never seem to do was reach Second Lake. One weekend that January it was nice and cold, with a fresh layer of snow on the ground. 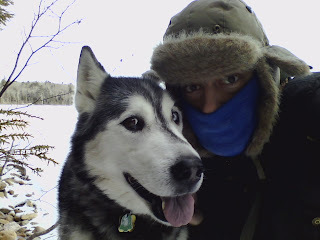 Nakita needed a good walk and I needed a distraction, so we set out with the express purpose of getting to Second Lake by going the long way. I think round trip took us close to five hours, but we did it. During that hike, I spent a lot of time thinking about possibilities, procedures and prognosis, but right then, right there in those woods none of it mattered. Nothing was going to kill me in the next five hours, so I could concentrate on the walk, the snow the sun and Nakita. I'd seen similar statements in the occasional pamphlets and literature I'd read, but bless them all, none of the other nurses or doctors ever brought it up, even after I did get a couple of bad fevers. There are certainly some cancers where any chance of infection is critically dangerous, and I have no doubt that my parents in-law would have taken in the fuzzy brood if it had come to that, but in all due respect to that first nurse ... what an utterly asinine thing to say to a patient. My wife was in school while I was sick and I absolutely refused to let her quit, so there were many days when I was alone in the house. Having the cats and Naktia around gave me company. They didn't care if I wanted to talk, or not, which is helps avoid some of those awkward conversations you have with people when you're seriously ill. The pets were someone to watch TV with, take naps with, to give a cuddle when I needed it and the cats would even play board games with me, as long as I was okay playing by their rules. What I came to realize was that, sick or not, they still needed me. I was the guy with the opposable thumbs who got them their food, stuffed them with treats, played with their toys and scratched their ears. 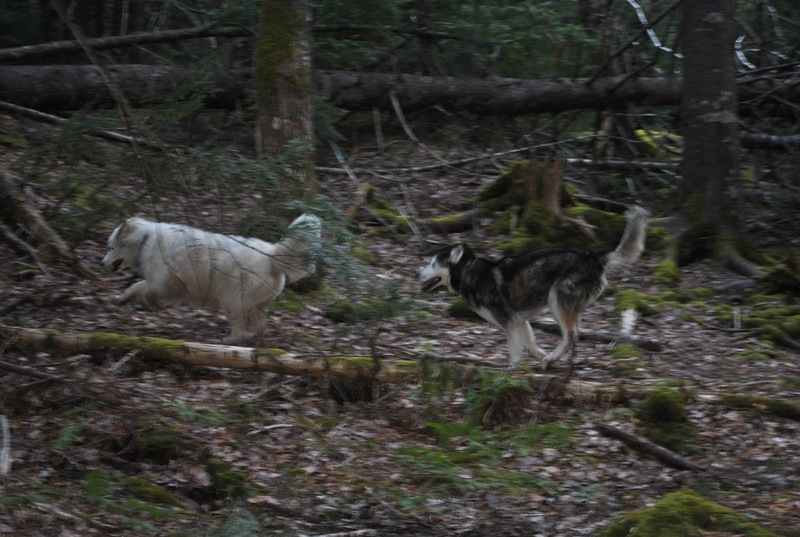 And Nakita still needed her walks. 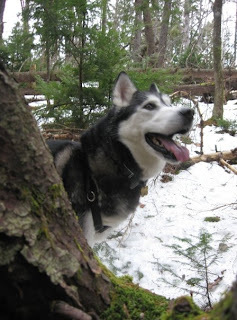 Around this time, Nakita was starting into that inevitable decline familiar to anyone with an older dog; walking a little slower and sleeping longer. She was getting too old to run away, was never that interested in other dogs and completely ignored cats and kids. All she really wanted to do was sniff at things. This made her the perfect dog for someone in my condition and between February and April we wore a groove into the neighborhood sidewalks, getting the exercise and fresh air I desperately needed between the long stints stuck in the hospital. She got so good at the route that I stopped holding her lead most of the time. I'd just drape it over her back so I could grab it to cross the street or if we were near a strange dog. That year, all my interactions with friends or family had a constant undertone of concern; the closer they were to me, the more pronounced the feeling. And being alone just gave me too much time to think. Being with Nakita gave me something that absolutely nobody else could have. She never asked how I was feeling and gave me something mundane, but necessary to focus on. What she ended up giving me were a few blessed minutes a week when I wasn't sick. Just like that day in the woods back in January, I was just some guy taking his dog for a walk. Last Thursday night, we took Nakita for her regular walk around the neighborhood. Then after supper she got a pork-chop bone to chew on and she went to sleep. When she woke up the next morning, her back hips had completely given out and she couldn't stand anymore. We took her to the vet for the last time that evening. It was almost one year to the day of my last chemotherapy session. Goodbye my Nakita. I am going to miss that smile.